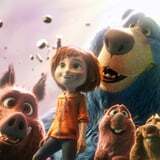 Home Movies Regal Cinemas Will Do Sensory-Friendly Screenings of Wonder Park This Weekend! Seeing a movie in theaters is such a fun experience, but for children with sensory processing disorders, autism, and other special needs, as well as those who aren’t big fans of the dark or a lot of noise, the cinema isn’t the most comfortable place to be. Because every child and their family should be able to enjoy a brand-new movie in theaters, Regal Cinemas is introducing the My Way Matinee program, a sensory-friendly movie-going experience that will feature lower sounds and brighter lights in the theaters.